The Cairnoodle is not a purebred dog. 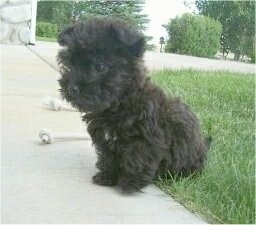 It is a cross between the Cairn Terrier and the Poodle. The best way to determine the temperament of a mixed breed is to look up all breeds in the cross and know you can get any combination of any of the characteristics found in either breed. Not all of these designer hybrid dogs being bred are 50% purebred to 50% purebred. It is very common for breeders to breed multi-generation crosses. 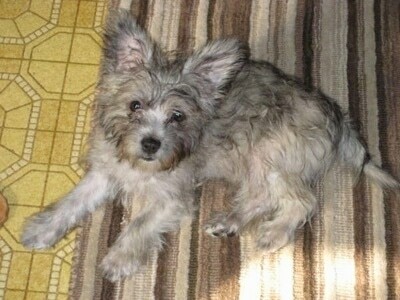 "My puppy Bryn is a female black brindle Cairn Terrier / Poodle mix. She was named Bryn after her brindle coloring, which has changed from a darker grey when I first got her, to a very light grey, and now she is getting some cream to her coat. Her coat is very soft, I expected her to be more wire haired. She is four months old and weighs 7 lbs. I am expecting her to get to be about 12 lbs. She has a personality and a mind of her own! She isn't afraid of anything. She is curious about everything, always trying to get into things and find out what she is missing out on. Her favorite thing to do is to learn new tricks; she is incredibly smart. She is only four months old and already knows how to sit, lie down, dance, shake, give kisses, and to walk on two legs. She's learning how to crawl, play dead and sit pretty currently. I take her on walks every day, just to get some of that energy out! She excels in her puppy training class, which has certainly calmed her down. She is always ready to play, even if she's exhausted! She loves playing with other dogs, no matter what size they are and loves children, esp. babies. (I'm pretty sure the milk on their chins lures her in.) She pretty much loves anything that moves. Her favorite toy is actually a cat toy, which had batteries that she can chase around. It takes a lot to tire her out, but when she’s sleepy, she is quite the cuddler. She loves lying across my chest or flat on her back with her li’l belly exposed. Overall she is a very lovable, well behaved, but very mischievous puppy. I am SO happy that I found her. My life has completely changed because of this little one!" "Addi is quite the snuggler. She is extremely independent, but does love to be around people all the time. 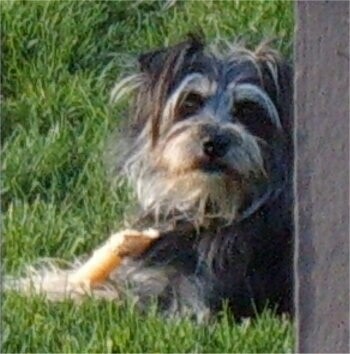 She has the stubborn terrier personality and she loves attention. She is very intelligent and has been a wonderful addition to our family. The first picture was taken when she was about 3 months and the second was taken at 6 months." 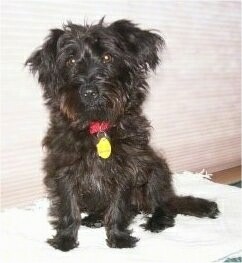 Madison the black Cairnoodle at 7 months old and 9.5 pounds—"Madison is a Cairn Terrier / Poodle mix called a Cairnoodle or Cairn-Poo. She is very smart and has lots of energy. We are in training right now to be a therapy dog."